Jathaka porutham for marriage offered by Tamilsonline, is a perfect Tamil horoscope compatibility system that analyze your horoscopes for marriage porutham. 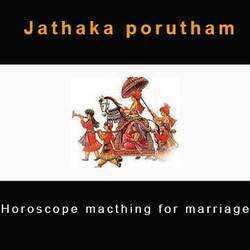 Marriage horoscope matching in Tamil is known as thirumana porutham, jathagam porutham, jodi porutham, kalyana porutham, vivaha porutham, kurippu parthal, kundali matching and manaporutham. Tamil jathagam porutham is a unique marriage matching method based on Tamil astrology, widely known as birth chart compatibility, natal chart compatibility and horoscope compatibility. In Tamil astrology, horoscope compatibility between a male and a female is identified by matching their horoscope according to the Tamil astrology compatibility guide for marriage. Jathaka porutham by date of birth offered by Tamilsonline are reported by analyzing the patterns and distributions of planets in respective and combined astrology charts. Thirumana porutham report offered by Tamilsonline includes compatibility of chevvai dosham, sarpa dosham and other marriage matching factors such as rajju, ganam, nadi, sthree theerkam, yoni, rasi, rasi athipathi, vasiyam, thinam, vethai, virudcham, ayul and mahendram. Marriage horoscope matching system based on Tamil astrology chart compatibility is the best recommended Tamil marriage matching method. However, if you do not know your exact birth details, we recommend you to check the Rasi Porutham or Zodiac matching for marriage, as well as Numerology matching for marriage. Get your fully detailed Jathaka porutham report that includes nakshatra porutham, rasi porutham and total of 13 marriage porutham, along with porutham explanation and dosha porutham for marriage matching, free.